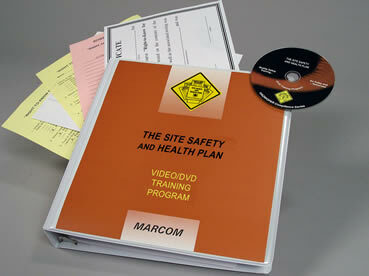 Description: MARCOM's "The Site Safety and Health Plan" HAZWOPER Compliance Videotape Program assists facilities in complying with the employee training requirements of OSHA's HAZWOPER regulation (29 CFR 1910.120), and helps employees avoid exposure to hazardous materials. The Program summarizes the various aspects of the Plan which is used in a hazardous materials facility or operation, and how the Plan helps to protect the health of anyone who regularly works around hazardous materials. Hazardous materials and waste are part of many work situations, and can be found on many types of job sites. OSHA feels that it is so important for employees to know how to recognize these potentially dangerous substances (as well as how to handle and dispose of them properly) they have mandated that anyone working with these materials receive comprehensive training in this area. In 1976, the U.S. Environmental Protection Agency (EPA) issued the Resource Conservation and Recovery Act (RCRA) to regulate the handling of hazardous waste "from cradle to grave". Since then other regulations have followed, including OSHA's 29 CFR 1910.120, also known as HAZWOPER. As part of these regulations, there are varying requirements for employee training, depending on an employee's specific level of involvement with hazardous materials. Areas covered in the program include Plan guidelines, medical surveillance, job hazard analysis, the five levels of training and responsibilities for HAZMAT emergency responders, site evaluation, personal protective equipment, spill cleanup procedures, decontamination, and more. The Videotape Program comes with a comprehensive Leader's Guide, reproducible Scheduling & Attendance Form, Employee Quiz, Training Log and Training Certificate. The program can be used as the basis for approximately two hours of classroom training. 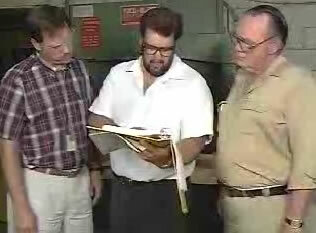 Site Safety & Health Plan Video and DVD Excerpt: Whether you're at home or at work, safety is always a major concern, especially when you're dealing with hazardous chemicals. You need to know what you can do to work with chemicals as safely as possible, as well as be prepared when something goes wrong. That's why your facility has a site safety and health plan. It is a written plan of action for people who work around hazardous chemicals. 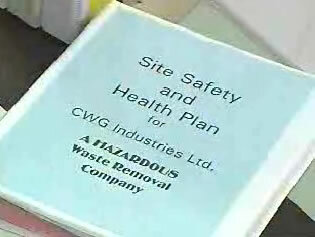 The plan sets out guidelines for working with chemicals safely, and provides procedures for dealing with accidents. Most of us have worked with some type of potentially hazardous chemical at some time or another, even at home. At home you have to rely on the chemical's label to tell you what to do if a leak or spill occurs. In the workplace you need more detailed information. Following the guidelines in the site safety and health plan will help you identify, evaluate safety and health hazards before they become a problem, so that you can stay safe. The goals of the site safety and health plan are; to reduce worker's risk of chemical exposure, guard the public from the site's hazards and protect the environment from contamination. To accomplish these goals the plan includes information on employee orientation, training, health and safety rules, correct work procedures and workplace inspections. Because quick action is often needed during a hazardous release the plan also discusses how to contact your site's emergency response team.